Race Lesson Learned: Always have a saint on your side. Location: Lake Mead National Park, Nev. Bonus: We both placed second–Matt was second overall and I was second overall female! Before I give you a race recap, it’s important that I tell you about my Grandma Burton. Anyone that met her would agree that she was a living saint. She raised nine children, doted on her 40 grandchildren, founded and operated her own daycare and somehow made time to attend daily mass. Her boundless energy, love of the Lord and enthusiasm for everything Irish (she was from Ireland and born on St. Patrick’s Day!) were unrivaled. Growing up, I was incredibly close to my grandma, spending every weekend and summer break with her. I was devastated when she, suddenly and unexpectedly, passed away during my freshman year of college. She died just one week before my first half marathon, so I decided to complete that race in her honor. The following year, I took it up a notch: I celebrated and remembered my Irish grandma by competing in my first marathon, the Virginia Beach Shamrock Marathon, on her birthday. So when Matt and I registered for the Saints and Sinners Half Marathon, and it just happened to be on the 10th anniversary of my grandma’s death, I knew we’d have a saint on our side during the race. As usual, Matt initially stumbled upon this race when searching for “fast, downhill half marathon races.” We were immediately intrigued by the race day and location: a Saturday race in close proximity to Las Vegas. Perfect. We could spend the rest of the weekend celebrating our race successes or drinking away our failures. Sold! As an added bonus, Matt’s parents, who live in Prescott, Ariz., offered to come cheer us on. Worried that our desert race was doomed because of the rain, we devised alternate plans. Matt declared that he’d run the 13.1-mile course, even if the race was canceled. 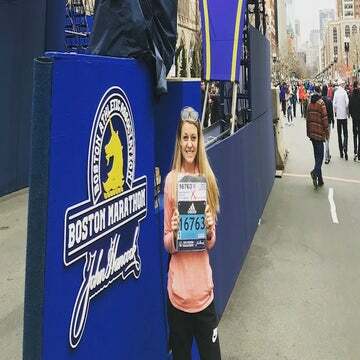 Just as I was concocting my own backup agenda, which did not include running and involved me going straight to Vegas, we received word from the race officials: the race was on. The rain slowed to a light drizzle as we made our way to the start tunnel (which was now fully raised!). My first few miles flew by. I thought my GPS watch was damaged by the rain as I saw my splits: 6:21, 6:28, 6:36. I knew that I couldn’t sustain that pace for the entire race. Just as I was coaxing myself to slow down, I encountered a massive hill, perfectly positioned at mile 3.5. It was divine intervention. Thanks, Grandma! At this point in the race, the rain had dissipated, allowing me to see all of the women ahead of me–some more clearly than others. I could count each of their bouncing ponytails, and I determined that I was in fourth place. I’d initially entered the race hoping to place in the top three. A bit tired and fatigued, I began to think my goal was unattainable. I started to become discouraged, but forced myself to maintain a consistent pace nonetheless. When I arrived at the halfway point, I approached what I thought was a normal water stop. Instead, I saw signs indicating that it was the “Relay Exchange.” In the rush of the morning, I had forgotten that this was not only a half marathon, but also a relay race. Two of the women previously ahead of me stopped there. In a twist of fate, I was suddenly in second place! Soon after this exciting development, the “entirely” downhill course altered in elevation. The course demanded that we then run 2 miles steadily uphill to a turnaround point before proceeding downhill to the finish. Halfway to the turnaround point, I saw Matt. I was ecstatic when I realized that he was in second place overall! A mile later, I reached the turnaround and began the last leg of the race. I was propelled and energized by the other runners. Running uphill to the turnaround, they were cheering me on: “You got this girl!” “You’re the second lady!” “GO!” I couldn’t help smiling and offering similar words of encouragement (see above for a picture of me in action, wearing the finisher’s shirt from my first marathon). Still riding on this wave of support, I realized I only had 3 miles to go. I saw Matt’s parents, who yelled a quick, “Looking great! Matt’s doing well, too!” I honed in on my form and concentrated on maintaining a steady pace. At the end of the race, we had to choose to run through either a saints or sinners finish tunnel. 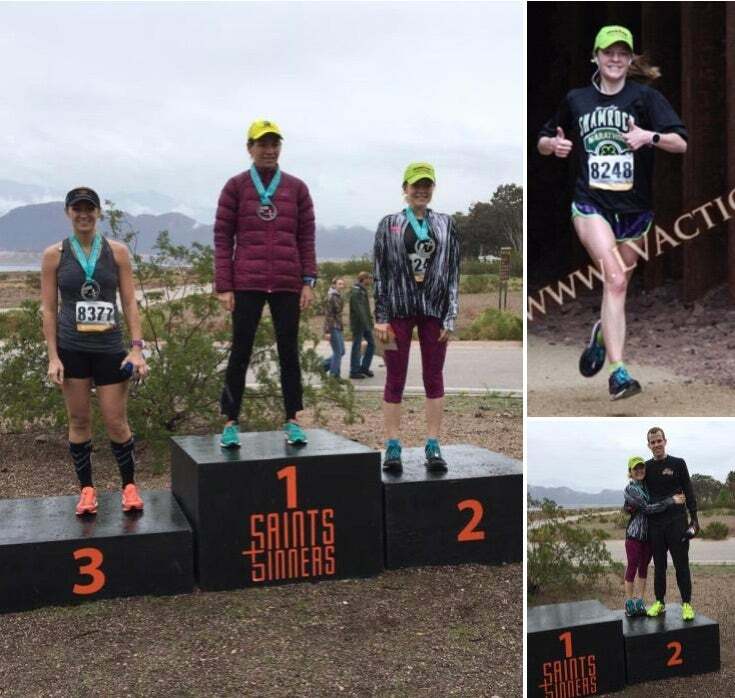 I know that my grandma was smiling down on me as I crossed through the saints tunnel, with a PR of 1:31:00 and as the second overall female. Though I didn’t see Matt’s finish, he also opted for the saints tunnel. We both attribute our success that day to my grandma. She would have been so proud that we both PRed and that we both placed second. So proud, in fact, that I’m certain she (even as the saint she was) would have condoned our celebratory weekend in Sin City!